Bishop, K.D., et al. Prostate cancer MRI to evaluate extra-prostatic disease: A single center analysis. (2015) Int J Cancer Oncol 2(1): 1-4. © 2015 Bishop, K.D. This is an Open access article distributed under the terms of Creative Commons Attribution 4.0 International License. Introduction: To examine the use of prostate magnetic resonance imaging (MRI) for staging after a new diagnosis of prostate cancer in our hospital system. There are no universally accepted recommendations to guide the use of MRI for staging purposes. In practice, prostate MRI is used to help distinguish T2 and T3 cancer. Prostate MRI is a modality that could aid in the triage of patients to radical prostatectomy or non-surgical treatments via accurate identification of organ-confined disease. Materials and Methods: We performed a retrospective review of prostate cancer patients who underwent staging MRI with 1.5T MRI with endorectal (ER) coil. We compared patient characteristics in patients who underwent surgery and those who did not, and used pathology reports from prostatectomy samples to calculate the negative predictive value (NPV) for extra-capsular extension (ECE) and seminal vesicle invasion (SVI). Results: We found that patients who underwent radical prostatectomy were younger, had lower Gleason scores, and had lower PSA values at diagnosis than patients who were not treated surgically. We calculated a NPV of 93.7% for SVI and 69.5% for ECE. We found variation in rates of accurate identification of T3 prostate cancer across the seven radiologists who interpreted MRI images in our study. Conclusions: 1.5T MRI with ER coil has a high NPV for SVI and a lower NPV for ECE. The utilization of 3TMRI may enable practitioners to more confidently rule out ECE. Future studies will be necessary to generate guidelines for use of MRI in prostate cancer staging. Prostate cancer is the most common male cancer in the United States. Patients are often diagnosed at an early stage without symptoms. These patients generally have a prolonged disease course. However, prostate cancer is a very heterogeneous disease, ranging from indolent to highly aggressive in nature, which emphasizes the importance of reliable risk stratification methodsj. The most commonly used screening test remains the serum prostate-specific antigen (PSA), despite recent recommendations narrowing its use. The diagnostic algorithm downstream of a positive PSA test is constantly evolving, but one well-accepted triage tool is the use of nomograms to predict ECE, SVI, and lymph node involvement. In patients with cT3 or cT4 disease or for those patients with a greater than 10% likelihood of lymph node involvement by nomogram, the current National Comprehensive Cancer Network (NCCN) guidelines provide a category 2A recommendation for MRI for local staging. In practice, the use of imaging in prostate cancer detection and staging extends beyond this recommendation, due to the reality that clinical assessment may underestimate local stage in 40-60% of cases. There is wide variation in the employment and acceptance of MRI as a staging tool. One factor complicating the generation of high-level evidence for the use of MRI is the rapid advancement of MRI hardware and analysis techniques. MRI with ER coil was validated in the 1980's; more recently, centers have been using higher field strength magnets (3T) as well as multi parametric analysis including diffusion weighted imaging and dynamic contrast-enhanced imaging. The utilization of different MRI imaging techniques may have contributed to the wide variability in reporting the sensitivity, specificity, and predictive values of MRI for staging purposes. The ability of MRI to detect ECE has been reported with sensitivities ranging between 23 to 91% and specificities ranging between 84 to 97%[11-13]. One study reported a positive predictive value of 79% and a negative predictive value of 91% for ECE with 3T MRI with ER coil. Similar studies have been performed to evaluate MRI for the detection of SVI, reporting sensitivities ranging between 25 to 100% and specificities of 62 to 99%. Positive predictive values have been reported ranging between 20 to 83%, and negative predictive values range between 79 to 96%. The majority of these data were generated from large tertiary-care centers. After approval by Rhode Island Hospital's Institutional Review Board and receipt of a waiver for informed consent, we collected retrospective data for patients with biopsy-proven prostate cancer who underwent prostate MRI for staging between 2005 and 2010. We identified the subset of patients whom subsequently underwent radical prostatectomy in the Alpert Medical School of Brown University hospital system and whose post-prostatectomy pathology records were available for review. Patients were excluded from our final analysis if prostate MRI was ordered for an indication other than prostate cancer, prostate MRI was performed for restaging after biochemical relapse, or if the patient was enrolled in a clinical trial. All prostate MRI examinations were performed on a 1.5-T system (Signa Excite, GE Healthcare) with a gradient strength of 120mT/m and using both a pelvic phased-array coil and balloon-covered expandable endorectal coil. Glucagon, 1mg, was administered subcutaneously immediately before the start of the examination. All patients were imaged in the supine position. After the acquisition of localizing images, sagittal T2-weighted single shot fast spin-echo imaging through the pelvis was performed to confirm the position of the endorectal coil. Axial, coronal, and sagittal thin-section, high-spatial-resolution T2-weighted fast spin-echo (FSE) images through the prostate and seminal vesicles were obtained using the following parameters: TR range, 3,000–4,000 milliseconds; TE, 120 milliseconds; echo-train length, 16; field of view (FOV), 12cm; section thickness, 3mm; intersection gap, 0 mm; matrix, 256 Å~ 192; and number of excitations (NEX), 4. Transverse axial T1-weighted spoiled gradient-echo images with a TR/TE of 325/4.2 and all other parameters matched to the axial high-resolution T2-weighted FSE sequence were obtained. Transverse axial T1-weighted spoiled gradient-echo images were also obtained from the aortic bifurcation to the symphysis pubis using the following parameters: 100/4.2; FOV, 38cm; section thickness, 5mm; intersection gap, 1mm; matrix, 256 Å~ 192; and NEX, 1. DWI was performed using a single-shot echo planar imaging technique with a TR of 3,000 milliseconds and a minimum TE; FOV, 18cm; section thickness, 3mm; intersection gap, 0mm; matrix, 128 Å~ 128; NEX, 6; ADC values were obtained from the DWI sequences performed with b values of 0 and 1,000 s/mm², and the ADC maps were generated by calculating the ADC value in each pixel of each slice. Seven radiologists, who were not blinded to the patients' clinical characteristics, interpreted MRI images. Descriptive statistics were used to compare patient characteristics using simple t-tests. A p-value ≤ 0.05 was considered significant. Data for ECE and SVI were tabulated as binary variables (0 for absence of ECE or SVI, 1 for presence of ECE or SVI) and summary statistics were generated via two-by two tables. Pearson's (chi)² analysis was performed to test for variance across MRI interpretation accuracy rates. All statistical analyses were performed with Med Calc software, version 12 (Ostend, Belgium). We identified 277 patients with prostate cancer who underwent prostate MRI between 2005 and 2010 whose medical records were under the purview of our IRB. We found that 75% of MRIs were ordered by urologists (n = 207, 7 different providers), 15% of MRIs were ordered by radiation oncologists (n = 41, 3 different providers), and 10% of MRIs were ordered by medical oncologists (n = 29, 2 different providers). 129 patients underwent radical prostatectomy. Sixty-eight patients did not proceed to surgery, 12 patients were enrolled in a clinical trial, and 68 patients underwent MRI for restaging purposes. Pathology results from prostatectomy samples were used as the gold standard test in our analysis. We found that patients who underwent surgery were younger (61 vs. 67.2 years old), had lower Gleason scores (average score 7 vs. 7.5), and had lower average PSA values (6.08ng/mL vs. 15ng/mL) at the time of diagnosis (Table 1). Using pathology reports, we calculated the negative predictive value of MRI for SVI and ECE. We found that 1.5 T MRI with ER coil had a negative predictive value of 93.7% (95% CI 87.9% to 97.2) when evaluating for SVI, and a negative predictive value of 69.5% (95% CI 60.34 – 77.6) when evaluating for ECE. We found significant variation in the accurate identification of ECE and SVI between radiologists, ranging from 0% accurate (of 3 prostate MRIs included in our study, with total of 20 interpreted during the study time period) to 92.3% accurate (13 prostate MRIs included in our study, with total of 45 interpreted during the study time period, p = 0.012) (Figure 1).The rate of accurate identification of ECE or SVI did not correlate to the number of MRIs interpreted during the study period. Eight cases of seminal vesicle invasion identified by pathologic analysis were not identified by MRI analysis. Thirty-six cases of ECE seen on pathology were not identified by MRI, and 3 cases of ECE were reported in the MRI interpretation, but not present on pathologic analysis (Table 2). Overall, there were zero false positive interpretations of SVI and three false positive interpretations of ECE. 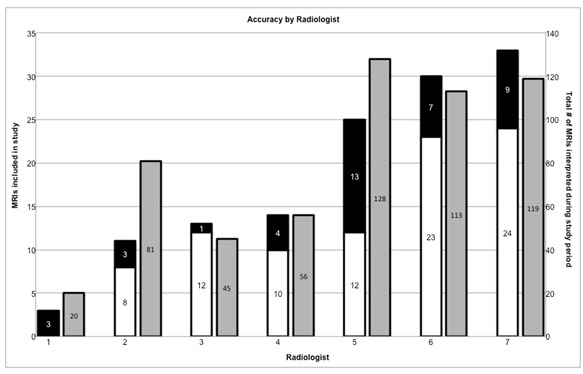 Figure 1: Accuracy rates for MRI interpretation by radiologist. Left axis indicates accuracy of identification of ECE or SVI for MRIs included in this study (black/white columns). Right axis indicates total number of prostate MRIs interpreted by each radiologist during the time period during which our study took place (gray columns). Numeric labels indicate number of MRIs in each category. In 2013, the American Cancer Society estimated 238,590 new diagnoses of prostate cancer, and 29,720 deaths from prostate cancer. The high prevalence and frequent diagnosis in the early stage of disease have driven research to inform optimal diagnostic methods and minimize the over-treatment of men whose disease would never have adverse clinical outcome or affect longevity. Conversely, selecting the appropriate intervention for management of aggressive disease is essential for best outcomes. As imaging technology continues to improve, we may be able to further refine our criteria for candidacy for radical prostatectomy based on MRI imaging. We believe our study represents a more common practice environment, where multiple subspecialties (urology, radiation oncology, and medical oncology) participate in different aspects of patient care with varying criteria for triage to staging prostate MRI. We believe our use of data from a 1.5T MRI with ER coil and the utilization of multiple radiologists for MRI interpretation make our study generalizable to common practice settings. Our study confirms that utilizing MRI for prostate cancer staging can provide a good negative predictive value (NPV) for SVI, which can aid in triaging patients to radical prostatectomy. The most frequent inaccuracy in our study was the high false-negative reporting of ECE, which resulted in a less compelling NPV for ruling out T3a disease. We also demonstrate a variation in accuracy between radiologists, which did not correlate to the number of prostate MRIs interpreted during the time period of our study. Given the significant false negative rate for ECE, the continued practice in our system is to perform nonnerve sparing procedures for intermediate- and high-risk disease present on initial biopsy. The absence of ECE on MRI is not yet deemed sufficient evidence to proceed with a more aggressive nerve-sparing approach. There are several limitations to our study. First, the retrospective design and relatively small patient sample limit the generalizability of our conclusions. Second, background clinical data, lab values, and pathology results were not uniformly available for all patients who underwent MRI during our extraction period, which could result in bias and imbalanced patient selection. There were no strict criteria for which patients were referred for prostate MRI; hence, we could not evaluate the preclinical decision making for each patient under study. Because the study was retrospective, we were unable to analyze how MRI results were used by the referring clinician and patient in deciding whether to pursue prostatectomy. In addition, by nature of the design of our study, it is not possible to calculate the positive predictive value of MRI for T3 disease, given the absence of pathology-confirmed extra-prostatic disease in patients who did not proceed to surgery. We believe that it is reasonable to employ more commonly available MRI modalities (1.5T MRI with ER coil) to rule out seminal vesicle invasion in anticipation of radical prostatectomy. Our findings suggest that the negative predictive value for ECE with 1.5T MRI is inadequate to safely triage patients for nerve-sparing radical prostatectomy, as a large percentage of these patients may in reality have extra-capsular disease. It is important to note that since our data extraction period, we have transitioned to the use of 3T MRI, which we anticipate will increase the diagnostic accuracy of MRI for ECE and SVI as has been previously shown. The next phase of our study will include collection of data for patients who underwent 3T prostate MRI to determine whether this change alone results in any differences in the predictive value of MRI in the evaluation of T3 prostate cancer. 1. Siegel, R., Naishadham, D., Jemal, A. Cancer statistics, 2013. (2013) CA Cancer J Clin 63(1): 11-30. 2. Wilt, T.J., Brawer, M.K., Jones, K.M., et al. Radical prostatectomy versus observation for localized prostate cancer. (2012) N Engl J Med 367(3): 203-213. 3. Roobol, M.J., Carlsson, S.V. Risk stratification in prostate cancer screening. (2013) Nat Rev Urol 10(1): 38-48. 4. Moyer, V.A., U.S. Preventive Services Task Force. Screening for prostate cancer: U.S. Preventive Services Task Force recommendation statement. (2012) Ann Intern Med 157(2): 120-134. 5. Eifler, J.B., Feng, Z., Lin, B.M., et al. An updated prostate cancer staging nomogram (Partin tables) based on cases from 2006 to 2011. (2013) BJU Int 111(1): 22-29. 6. Mohler, J. L., Armstrong, A.J., Higano, C.S., et al. Prostate Cancer. NCCN Guidelines Version4. 2013. (2013). 7. Futtere, J.J. MR imaging in local staging of prostate cancer. (2007) Eur J Radiol 63(3): 328-334. 8. Plawker, M.W., Fleishe,r J.M., Vapnek, E.M., et al. Current trends in prostate cancer diagnosis and staging among United States urologists. (1997) J Urol 158(5): 1853-1858. 9. Hegde, J.V., Mulkern, R.V., Panych, L.P., et al. Multiparametric MRI of prostate cancer: an update on state-of-the-art techniques and their performance in detecting and localizing prostate cancer. (2013) J Magn Reson Imaging 37(5): 1035-1054. 10. Engelbrecht, M.R., Jager, G.J., Laheij, R.J., et al. Local staging of prostate cancer using magnetic resonance imaging: a meta-analysis. (2002) Eur Radiol 12(9): 2294-2302. 11. Bloch, B.N., Furman-Haran, E., Helbich, T.H., et al. Prostate cancer: accurate determination of extracapsular extension with high-spatial-resolution dynamic contrast-enhanced and T2-weighted MR imaging--initial results. (2007) Radiology 245(1): 176-185. 12. Bloch, B.N., Genega, E.M., Costa, D.N., et al. Prediction of prostate cancer extracapsular extension with high spatial resolution dynamic contrast-enhanced 3-T MRI. (2012) Eur Radiol 22(10): 2201-2210. 13. Perrotti, M., Kaufman, R.P. Jr., Jennings, T.A., et al. Endo-rectal coil magnetic resonance imaging in clinically localized prostate cancer: is it accurate? (1996) J Urol 156(1): 106-109. 14. Johnston, R., Wong, L,M,, Warrenm, A., et al. The role of 1.5 Tesla magnetic resonance imaging in staging prostate cancer. (2013) ANZ J Surg 83(4): 234-238. 15. Griner, P.F., Mayewski, R.J., Mushlin, A.I., et al. Selection and interpretation of diagnostic tests and procedures. Principles and applications. (1981) Ann Intern Med 94(4 Pt 2): 557592.